1. Cleaning improves the concentration of attention. Chaos in a dwelling prevents a person from fully focusing on really important things, while the cleanliness in the house helps to concentrate and “clear” thoughts. 2. This is an ideal exercise. Just walk around the house with a vacuum cleaner, wash the floors or drag a couple of bags of garbage and no gym is needed. 3. Cleaning helps to overcome stress. What can you do with unnecessary things? They can be sold or given to the needy. Having received additional earnings or having done a good deed, you can feel a little bit happier. In addition, physical activity contributes to the release of endorphins, responsible for our good mood. 4. Saves time. You need to get rid of the clothes that you will never wear. So you will significantly free up your closet, and all the necessary outfits will be in view, which will significantly save time of getting ready for work or for a walk. This applies to other items in the house, left on “maybe it will be useful”. 5. Cleaning in the house motivates to restore order in other aspects of life. Putting an order in the house can inspire you to “clean” everything in your personal computer, in the caryou’re your phone. 6. “No” to allergies! In each house lots of allergens “live”, about which a person may not even have any idea of, that cause a runny nose, sneezing, tearing. To eliminate them will help a thorough cleaning of the premises. 7. You will love your home. It is psychologically difficult for a person to live in a premise in which he or she doesn’t feel comfortable. 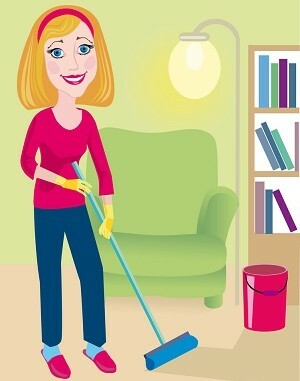 Do a rearrangement of furniture, get rid of trash, make a total cleaning of the apartment. Remove all needless, unnecessary, old things from the apartment and you will feel completely different.